Most of horse training is to teach the horse our signals that he needs to know to keep ourselves and the horse as safe as possible in different situations. If we check human health insurance claims, a fair number are horse-related. New Zealand, with a population in 2017 of 4.79 million people saw 7873 people with horse-related injuries. Of these, 2852 fell off a horse. Horse accident insurance claims for 2017 came to $9,669,964.00. No one knows how many horses have a short life because they don’t fit in with the demands of their constrained domestic existence which is, in many cases, completely foreign to a horse’s natural lifestyle. The health insurance figures above suggest that there is room for improvement in human-horse and horse-human communication. Fortunately, more and more people are becoming aware that the best training fosters two-way communication between person and horse. Writers such as Sharon Wilsie (HorseSpeak) and Rachaël Draasima (Language Signs & Calming Signals of Horses) and my book, Conversations with Horses (see my Books section), are helping horse people to appreciate just how much information horses impart to us with their body language. A horse’s world view is dictated by the way he senses the environment. His vision, hearing, smell and sense of proximity are different and mostly superior to ours. He has evolved adaptations that allow him to survive in open grassland rife with predators and profound seasonal changes. Humans have a different history with different selection pressures. We sense our environment differently. With us, verbal language has, on the surface, supplanted body language. Horses use distinct body language. Sadly, many people are blind to this language or choose to ignore it. The magic is that once we begin to observe and pay attention to what horses are saying, we start to pick up the nuances and get better at tailoring our training to the sensitivities of individual horses. While there are differences, there are also similarities. Both humans and horses are gregarious*. They live in groups with extensive social interaction between group members. Living in a group means that there is always a balance between competition for the same resources and the need to maintain peaceful relations. When resources are plentiful, there is minimum competition and maximum peacefulness. When resources are scarce, peacefulness is interrupted by competition as the more assertive group members jockey for the best resources. Although people don’t consider body language as important as spoken language, we still display it clearly. We also react to it subconsciously. Between spouses and close friends, it speaks volumes. People like scam artists, who prey on other people’s susceptibilities, are astute readers of body language, using it to single out their victims. Horses can definitely read our body language, despite the species barrier. As well as reading each other’s body language, horses read the body language of their predators. They know when they are in hunting mode, just passing by, or resting in the vicinity. Horses are also aware that their own body language sends messages to predators, who look for signs of weakness or lameness. That is why it is often so hard to know if our horse is in pain. They will hide pain and infirmity as much as they possibly can. What are ‘Okay to Repeat’ or ‘Okay to Proceed’ Signals? ‘Okay Signals’ are initiated by the horse to let us know that they feel okay for us to repeat what we are doing or to carry on with a procedure that involves a variety of things. When I’m walking on the road with Boots, I’ve become aware of her need to stop and assess things such as cows moving in the distance, a vehicle in an unusual place or something that has changed in the environment since we last passed by. If I stop with her and wait, paying attention to what has caught her attention, we are ‘on the same page’. I breathe out loudly to show that I’m okay with this thing that has caught our attention and relax into ‘zero intent*’. Eventually Boots will lower her head and bring her attention back to me, which tells me that she has satisfied her need to notice and is ready to walk on. This is the most basic ‘okay’ signal for us to watch out for. Once we learn to pause with zero intent* (items with an asterisk are defined on the GLOSSARY page) long enough to allow the horse to communicate with us, we can discover ways that individual horses will let us know when they are ready to repeat whatever we are asking, so they can earn another click&treat. I think many good trainers are already unconsciously aware of these signals, without having given the concept a name. 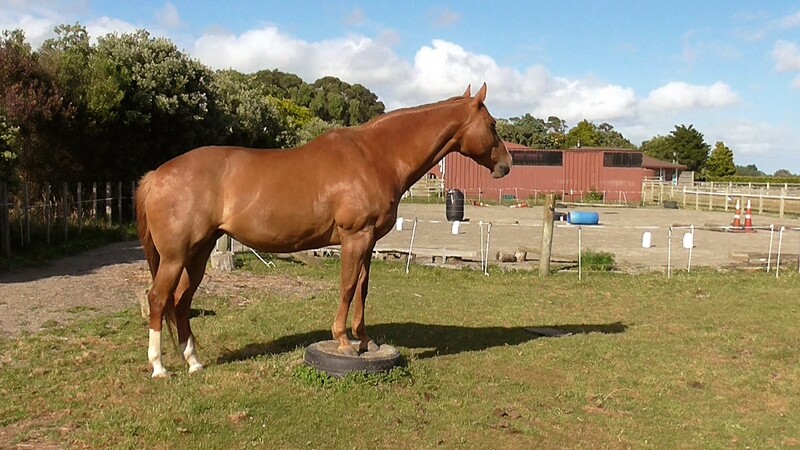 I think that isolating and focusing on this type of horse-initiated signal can open a new vista of training. The horse not understanding what we would like him to do. Environmental distractions taking precedence over trainer requests. We have to observe carefully if we want to learn to recognize horses communicating when they are not shouting loudly with their body language. Unless we train ourselves to understand the finer points of their signaling, we miss most of what they are trying to tell us. Most horse communication is visual. Horses in an established group seem harmonious because a flick of an ear, the tilt of the neck, a single swish of the tail, a certain posture of the body, are all highly meaningful to another horse. People are usually, understandably, so focused on their own agenda that they miss most of these signals. But we can do better. Since we remove horses from their natural life and make them captive to us, the least we can do is try hard to learn their language and use it to aid two-way communication. The concept of waiting for a horse to give permission or consent for us to carry on with a task may be a novel idea for some people. As mentioned earlier, good trainers probably do this subconsciously. They continuously observe the horse’s body language to gauge whether the horse is comfortable about proceeding with the training or repeating a specific task. Is it best to pause for a while, do something easy or finish for the day? Our fondest personal memories are often of things we have successfully initiated and controlled. In the same way, horses respond positively to having control and ownership of what is going to happen next in their lives. In other words, a sense of control is as reinforcing to horses as it is to people. We steal a great deal of their personal control when we bring them into captivity. When it becomes the horse’s idea to initiate their handler’s next action, the horse begins to share ‘ownership’ of the behavior we are working with. Such a feeling of ownership alleviates the anxiety and tension that arise if the horse is constrained and forced to accept what is being done to him. Much of what we do with a horse requires him to stand still. Standing still when unusual things are happening is not what evolution found useful for horse survival. lt is very much a skill that must be taught and developed. For many activities, we’ll still have to read the horse’s overall body language to know if he is okay to proceed with what we are doing. But for some specific tasks, we can incorporate an ‘okay to repeat’ or an ‘okay to proceed’ signal from the horse. There are several ways of doing this. If a horse has a strong history of positive reinforcement* for staying parked in a relaxed manner with his nose on or near a nose target, we can use his willingness to stay, and touch the target again, as his ‘okay to repeat’ signal. Horse has a strong history of positive reinforcement for touching a target (see Chapter One). Handler is aware of moving in and out of his/her ‘zero intent’ posture (see Chapter Three). A familiar target tied or set at the height of the horse’s nose. Start with halter and lead on, with the lead draped over the horse’s neck or back so it is easy to reach if the horse chooses to walk away. If he moves away, quietly walk a circuit that brings you both back to the target; click&treat if the horse touches his nose to the target, then finish the session. If he chooses not to touch the target when you return to it, go back to a few sessions with a high rate of reinforcement for touching a series of targets hung around your training area, before returning to the task in this chapter. You can also have the horse at liberty and if he chooses to walk away, the session is automatically finished. Keep each session very short. Ideally always stop before the horse shows any desire to walk away, even if it means you only do one repeat. Mini-sessions where the horse is continually successful at earning his click&treat make for rapid learning and a willingness to ‘do it again’ next time. You are also showing the horse that it is okay to say, “I don’t feel like doing that right now,” without any value judgement on his behavior. You are giving him the choice about whether he wants to keep on working for clicks&treats, or he’d rather go away and do his own thing. Horse realizes that the handler will stay at ‘zero intent’ unless he touches his nose to the target. Handler waits patiently for the horse to touch the target as a sign that the horse is ‘okay to repeat’ the task. Horse realizes that he can move away if he doesn’t feel like playing. Handler realizes that there are times when it is okay to let the horse have a ‘say’ in what will happen next. #156 HorseGym with Boots: OKAY TO REPEAT SIGNALS. 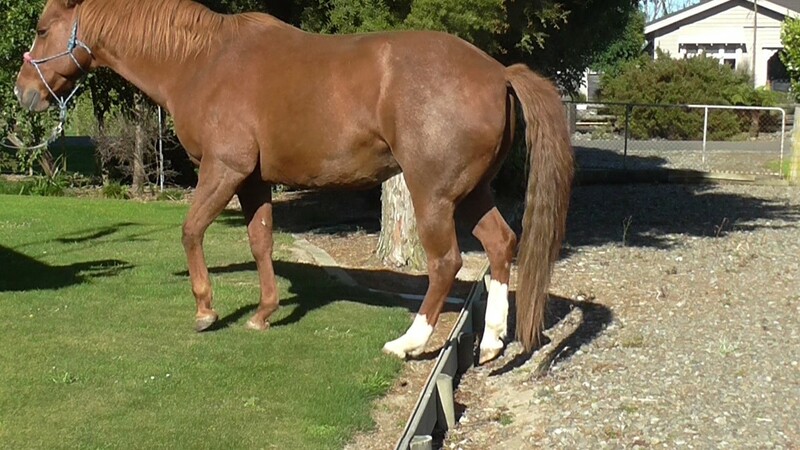 If the horse is wary about the object, walk away backwards (or have another person walk away backwards holding it while you follow with the horse at the horse’s pace) and have the horse follow; click&treat any sign of willingness to approach the object more closely until he is able to put his nose on it to earn a click&treat. Horses tend to follow things moving away from them and move away from things coming toward them. Yet most horse handlers expect a horse to stand still while they approach with an unusual object. If we allow the horse the time to make up his own mind that an object is harmless, he will accept it as so. Horses naturally use approach and retreat whenever they come across something new. Life is much easier if we use their world view to facilitate our training, rather than restrict their movement and force them to accept something. Horse touches nose to target: click&treat in a position that has the horse take his nose slightly away from the nose target. Handler allows horse to investigate any gear he is about to use (brush, spray bottle, clippers, halter, cover, saddle blanket, paste worming tube, saddle or harness, bridle): click&treat, maybe several times, depending on how comfortable the horse is with the item already. Handler lifts arm with brush (or whatever) toward the horse keeping it at a distance that maintains the horse’s relative relaxation (under threshold*): click&treat. Horse either leaves after the treat or touches the nose target again. If the horse touches the target again, the handler repeats approaching the horse with the brush, careful to click&treat while the horse is still under threshold*, i.e. he still looks confident about what is going on. After each click&treat, the handler resumes the ‘zero intent*’ position and waits for the horse to either touch the nose target again or take the option to leave. 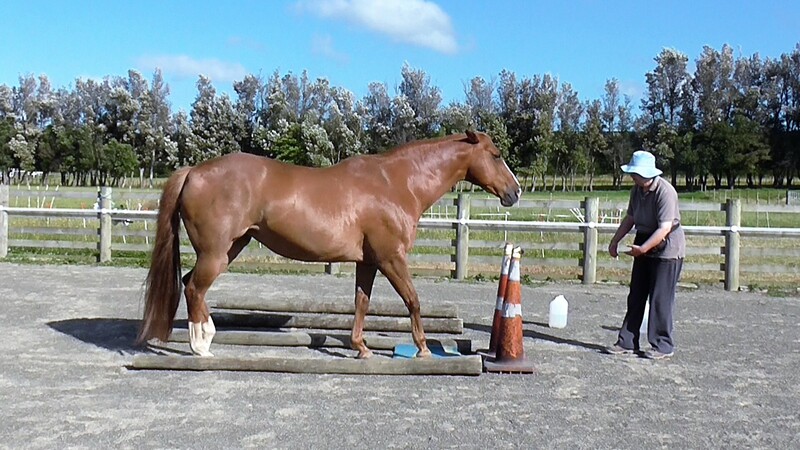 Ideally the handler will stop each mini-session before the horse feels the need to walk away. If the horse leaves, it is also the end of that mini-session. The handler now has useful feedback*. He or she asked for more than the horse could offer comfortably at that time. Done quietly and carefully with many mini-sessions that don’t push the horse beyond his comfort zone*, the horse can usually relax into the new game which consists of the new things he has to allow if he wants to elicit more treats from the environment (his handler). The horse’s comfort zone will gradually expand to include the new task we are doing with him. At that point, the acquisition* stage is over, and we start to focus on fluidity*, generalization* and maintenance*. This is a video clip from a while ago which demonstrates the same idea. #4 HorseGym with Boots: Parking at a Nose Target. 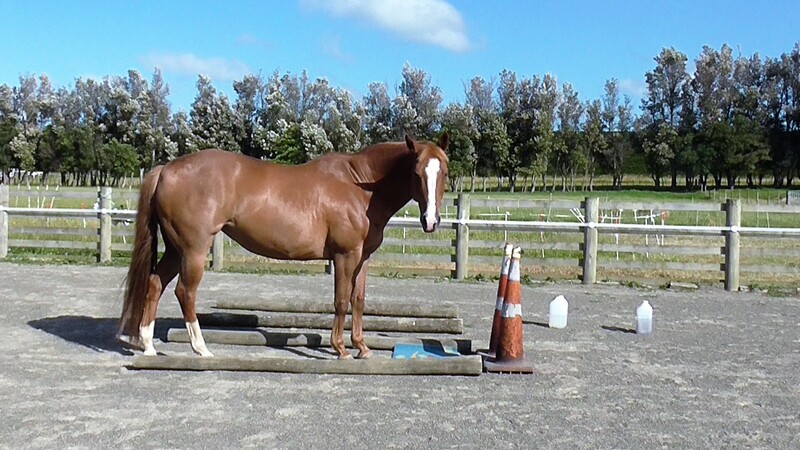 Another way to ensure consent or ‘permission to proceed’ is to ask the horse to park his feet on a mat. The horse’s willingness to stay parked lets us know that he is okay for us to proceed. ‘Okay to Proceed’ is a little different from ‘Okay to Repeat’. I use it for foot care which is a series of tasks rather than a repetition of the same task. Changing bandages and dealing with riding boots on and off, blankets on and off are also more in the line of ‘procedures’. A procedure like putting on riding or driving tack could also be thought of in the same way, although I found a nose target also worked well for tacking up. Once we have taught standing on a mat with some duration, we can use the horse’s willingness to stay there as a sign that he is probably okay for us to proceed with whatever we are doing. If we use a mat with frequent short sessions for teaching vet procedures or foot care, the horse will soon realize that the mat coming out means clicks&treats are on the way. If the horse feels the need to move off the mat it is critical that we don’t restrict or punish him in any way. We quietly walk a circuit together to return to the mat and halt on it: click&treat for the halt on the mat. We must ensure that the mat always remains a desirable place in the horse’s mind. After returning to the mat, we can return to earlier slices with the task we are working on to find where the horse can still be continually successful, then end on a good note. Or we can use the mat to do something easy that the horse already knows to re-establish the mat as a good place to be. Ideally, the handler will be able to read the horse’s increasing body tension before the horse moves off the mat and take one of the two options above or initiate a relaxation break before resuming the training. To explore this concept with your horse, choose a simple task that the horse will probably find pleasant. Once the horse buys into the concept of giving us an ‘okay to repeat’ signal, we can expand to other physical care and vet procedures. If you can choose one that is new to the horse it may be easier because it won’t have the baggage of past experiences. But we can also add this new dimension to a task the horse already knows. Once I became more consciously aware of these signals, I realized that Boots had been using them in a variety of contexts and I had been taking note of them. Once I began observing more closely, I soon realized that she had several signals for letting me know when it was ‘okay to repeat’. #154 HorseGym with Boots OKAY to REPEAT shows Boots’ signal for rubbing the inside of her ear, which we had never done purposefully before. It also has an interlude of belly-scratching with a new tool. #155 HorseGym with Boots OKAY to REPEAT for TOOTH INSPECTION: shows Boots’ signals for allowing me to lift her lips to inspect her teeth. Targeting the eye to a cloth. Targeting the mouth to a paste worming tube. Comfort with scissors or clippers. Teaching specific tasks within a chained procedure such as comfort with saddle pad put on and removed, saddle put on and removed, girth tightened and loosened, handler putting foot in stirrup, handler leaning across horse, and so on. Horse and handler are clicker savvy*. Horse at liberty in a safe area. The horse needs to be free to move away if he no longer wants to take part. Handler is consistent with returning to ‘zero intent’ to wait for the horse to give his ‘okay to repeat’ signal. Horse learns that nothing will happen until he initiates it with his ‘okay to repeat’ signal. The procedure is basically the same with any task. 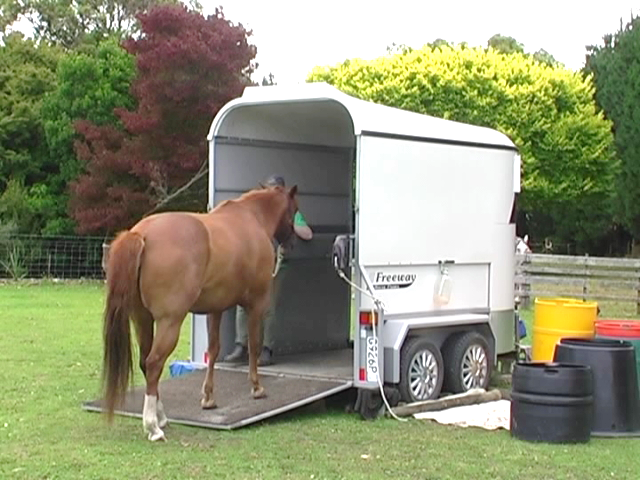 We have to be mindful that some horses have never been given a say in what is going to happen once they are haltered or confined in a small space, so it could take a long time for them to try something brand new to their experience. If you have played with your horse at liberty in the past, and allowed expression of opinion, it may all happen quickly. Gently indicate to the horse what you would like to do; click&treat. Maybe repeat a couple of times to establish the task. Then remove all signal pressure and take up your ‘zero intent’ position. Observe the horse closely but don’t stare at him with intent. Keep your body language totally relaxed. It may take a while for the horse to make a movement that seems significant. When the horse makes a movement that you think is an expression of his willingness for you to repeat the task, quietly activate the task with short duration, then click&treat. When I did this with ear-rubbing, I initially rubbed only once or twice before the click&treat. Eventually I began rubbing a bit longer before the click&treat. After the treat is delivered, return to ‘zero intent’ mode and wait for the horse to repeat his signal (he may have, or develop, a variety of these signals, as Boots shows in the video clips). As with most training, doing a little bit (three minutes or 20 treats) often is the key to rapid progress. It gives the horse time to process what has happened and often he is keen to repeat next time you set up the situation. It could be that ear-rubbing is intrinsically pleasant for a horse already relaxed in human company. Even if it is, I want the horse to eventually relate offering of an ‘okay to repeat’ signal to any task that will earn a click&treat. Tasks like eye care and checking teeth and allowing skin pinching and toothpick pricking to prepare for inoculations will not be intrinsically pleasant. All horses are different, both innately and due to their life experiences. Therefore, each horse and handler will together create a unique ‘okay to repeat’ signal language that works for them. her smile, and offering to place her nose between my hands for tooth inspection. This entry was posted in Thin Slicing a Task, Training Plans and tagged Consent Signals, equine body language, Okay Signals, Positive Reinforcement Training, Start Buttons on December 22, 2018 by herthajames. Photo: Using targets as ‘destinations’ makes it much easier to give meaning to our request in a way that the horse easily understands. Reaching the target, whether it is putting the front feet on a mat or touching the nose on a stationary object, earns the horse a click&treat. We can then move between targets to encourage the horse to come with us willingly because there is always something for him to look forward to – the next click&treat when we reach the next destination. Training with the click&treat dynamic is a skill worth learning well, but it is not the only thing we have to learn well. Some people handle/condition a horse’s behavior in a way that encourages the horse to always look to the handler – a form of ‘learned helplessness’. The horse is asked to subjugate his own observations, feelings and natural responses in favor of what the handler requires him to do. Other people set themselves the interesting challenge of doing everything with their horses using only positive reinforcement training (often called ‘clicker training’). They pair each desired response with a marker signal (click) followed immediately by a food treat. They feel that this is the only way to keep a horse’s ‘sparkle’ alive. Somewhere between these two extremes, fall the people who teach many things with the click&treat dynamic, but they also understand, respect, learn and use universal horse language. In their view, any horse education system that fails to acknowledge group social order, different horse character types and how horses succinctly communicate with body language, will have limited success. From our human standpoint, we could define ‘success‘ as having a horse that is safe and fun to be with and that we can take places for exercise to maintain blood circulation health, overall fitness and mental stimulation. Once we have all that, we can endlessly refine the basics and teach new patterns and tricks. Encourages accurate observation of what the horse is doing in order to pick the ‘clickable moments‘, which are also the moments that signal/cue pressure is released. Therefore becoming a good clicker trainer also hones the skill of becoming an excellent trainer with simple ‘release reinforcement’. It teaches ‘thin-slicing’ — the cutting of a large task into its smallest ‘clickable’ components so that we can get the horse confident with each tiny ‘slice’. Then we can chain the slices together until the whole task is achieved. This way of teaching/learning, often called ‘mastery learning‘ keeps the horse successful all the way through the process. A clicker-savvy horse knows that if the click&treat is withheld, they need to try something else. Developing the two skills above will greatly increase the ‘feel‘ of the handler. That ‘feel‘ will translate to the times when a good choice is use of ‘release reinforcement’ by itself. Feeling what the horse is doing — understanding what his body language is saying and knowing how to respond to that with our feel and body language, is the key to training with signal pressure and release of signal pressure (‘release reinforcement’). What horses gain from positive reinforcement Horses trained with the click&treat dynamic discover that they can have a voice. Once they learn that a certain behavior will earn them a click&treat, they can become pro-active in offering that behavior. For many horses this is huge because in the past things have only been done to them or demanded of them — they could only be re-active. When a task is thin-sliced so they understand each part of the training process, the horse’s learning can progress in leaps and bounds. We’d all rather work for a boss who praises what he likes rather than one who only criticizes what he doesn’t like. Horses are not blank pages on which we write what we want. They already have a perfectly good language. It seems logical to learn it and use it as best as we can with our non horse-shaped bodies. Horses are very generous with their interpretation of what we mean. No doubt we have a very funny accent, but unless they have been traumatized by humans, they are happy to learn new things and accept us as part of their personal herd. Social Group Once the horse accepts us as part of her personal ‘ in-group’, we have a position in the group social order. The two things go together. We can’t form a bond of understanding with a horse unless he or she lets us into their social group. Once we are part of the social group, we have a ranking within it. If the horse can move our feet at will, she or he stands above us in the social order. If we can ask move the horse’s feet, we rank above him her in the social grouping recognized by the horse. When people don’t understand this dynamic, or chose to deny/ignore it, things might not go well. Horse Character Types Like us, horses can be innately anxious or innately confident and imaginative. They come as extroverts who like to/need to move their feet a lot and they come as introverts who prefer the quiet life. A careful look at how our horse perceives and reacts to things can give us insight into how we can best proceed with an individualized training program. What works perfectly with one horse can be quite problematic with another. Universal Horse Language Horses have a complex communication system using their body language and a few vocalizations. They ‘message’ other horses with body tension, body orientation, neck position/movement, ear position, tail activity, posturing, striking out, kicking, biting, nibbling. How they use each of these depends on their intent at the time. An ‘alarm snort’ will instantly have the whole herd on alert. Quietly turning the head away as another horse (or a person) approaches is an appeasement signal. With the aid of body extensions which make us as tall and long as a horse, and simulate a horse’s expressive tail, we can more clearly emulating universal horse language. If we are good at it and use our movements consistently, any horse will understand our intent without us ever needing to touch the horse or use a rope. We can establish our position in the social order by ensuring we can move the horse’s feet in a variety of situations while the horse is at liberty to move away, as it would be in a natural herd situation. Once we have established our social position, we maintain it by the way we behave. Anxious type horses may rarely challenge our position. Confident, imaginative type horses may well challenge our position regularly. In a natural herd situation, they have the drive and sparkle to work their way up the group’s social order. With an understanding of, horse character types, equine body language, and how the social order works, we can flow with the information the horse gives us via his behavior and body language. Skills of observation, timing and ‘feel’ allow us to decide how we will use clicker training to make his life in his strange human-dominated world a little bit more interesting and understandable. 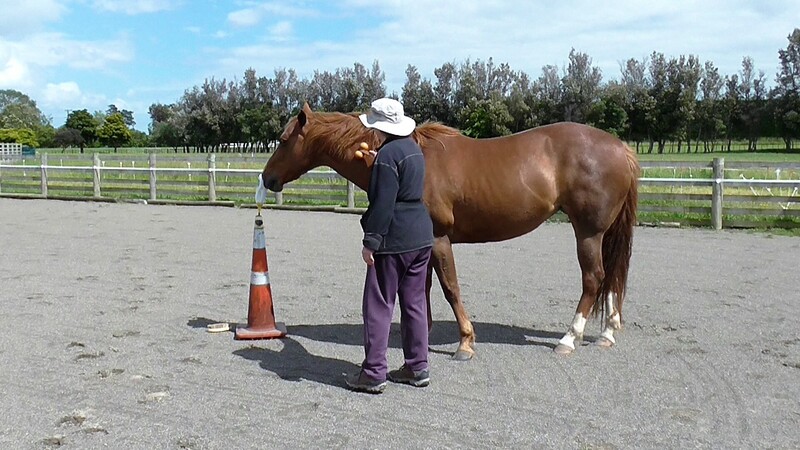 With equine clicker training, we experiment to find out what the horse can already do, then build his skills in a way that has him being continually successful. The link below contains a bit more information about horse character types. This entry was posted in General Comments and tagged body extensions, Clicker Training, equine body language, Equine Clicker Training, Hertha James, herthamuddyhorse, Horse Agility, horsenalities, Natural Horsemanship, Positive Reinforcememnt training, Safety with horses, social order, universal horse language on March 22, 2015 by herthajames.